From farming to forestry and fisheries, agriculture greenhouse emissions have nearly doubled over the past 50 years and may increase by another 30 per cent by 2050, according to new estimates out today from the UN Food and Agricultural Organization (FAO). "FAO's new data represent the most comprehensive source of information on agriculture's contribution to global warming made to date," said Francesco Tubiello of the agecny’s Climate, Energy and Tenure Division. For the first time, FAO has used its own FAOSTAT emissions database to estimate global greenhouse gas emissions from agriculture, forestry and other land use in contributing to the Fifth Assessment Report of the Intergovernmental Panel on Climate Change (IPCC). Emissions from crop and livestock production grew in 2001 from 4.7 billion tonnes of carbon dioxide equivalents (CO2 eq) to more than 5.3 billion tonnes in 2011 – a 14 per cent increase. Meanwhile, net greenhouse gas emissions due to land use change and deforestation registered a nearly 10 percent decrease over the 2001-2010 period – averaging some 3 billion tonnes CO2 eq year over the decade. FAO's data based on country reports show that while those emissions continue to increase, they are not growing as fast as emissions from fossil fuel use in other sectors – actually decreasing over time the share of agriculture and other land use out of total anthropogenic emissions. The largest source of emissions within agriculture is enteric fermentation – methane produced by livestock during digestion and released via belches. In 2011, this accounted for 39 per cent of the sector's total greenhouse gas outputs and increased 11 per cent between 2001 and 2011. In 2011, 14 per cent of agricultural emissions (725 Mt CO2 eq.) were generated while applying synthetic fertilizers – the fastest growing emissions source in agriculture – having increased some 37 per cent since 2001. Greenhouse gases resulting from biological processes in rice paddies that generate methane make up 10 per cent of total agricultural emissions, while burning savannahs accounts for 5 per cent. FAO data revealed that in 2011, 45 per cent of agriculture-related greenhouse gas outputs occurred in Asia – followed by 25 per cent in the Americas, five per cent in Africa, eleven per cent in Europe and four per cent in Oceania. The new FAO data also provide a detailed view of emissions from energy use in the agriculture sector generated from traditional fuel sources – including electricity and fossil fuels burned to power agricultural machinery, irrigation pumps and fishing vessels. "Up to now, information gaps have made it extremely difficult for scientists and policymakers to make strategic decisions regarding how to respond to climate change and has hampered efforts to mitigate agriculture's emissions," said Mr. Tubiello. FAO is already generating disaggregated assessments along supply chains and analyzing the effectiveness of comprehensive mitigation interventions in the livestock sector. This improves their overall resilience and their food security and allows the countries to tap into international climate funding and accomplish their rural development goals. “We also see much interest in capacity development on these topics at country level and respond to these needs through regional and country-level activities around the globe,'' he added. 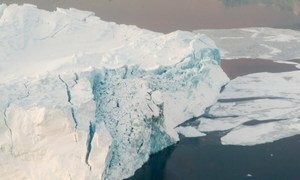 The effects of climate change are already occurring in all continents and across the oceans, and the world, for the most part, is ill-prepared for their risks, says a United Nations report issued today, which also warns that while action can be taken, managing the phenomenon’s impacts will be difficult on a rapidly warming planet.